Everyone should have a familiar place where we feel comfortable and loved. This book shows one child's special place and what is done there. The place where this child feels safe and warm is with his family at home. 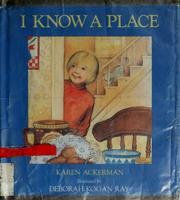 Ackerman, Karen, “I know a place,” Children's Picture Book Database at Miami University, accessed April 21, 2019, https://dlp.lib.miamioh.edu/picturebook/items/show/6289.